for a Night Under the Stars! TOUR AREA - tributaries of the Chester River and Chesapeake Bay, including the west fork of the Langford Creek, Shipyard Creek, and Gray's Inn Creek. 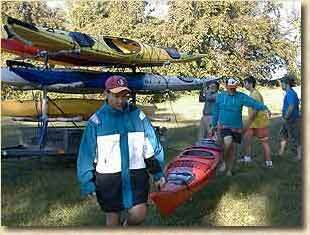 KAYAKS AND GEAR - sea kayak, paddle, pfd, transport, and a guide. 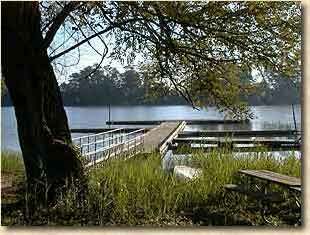 OVERNIGHT AT THE CAMPSITE - tents and camping equipment provided (you supply personal items and towels). osprey, herons, bald eagles, egrets, occasionally river otters and beaver, in June, mating cow nose rays, and our favorite, broaching rockfish (striped bass). In the fall the skies are filled with migrating waterfowl. If you're a birder, bring your Peterson's along to help the rest of us in bird identification. 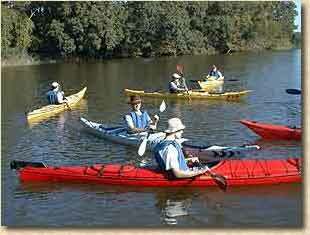 Kayak Camping is suitable for paddlers of different skill levels but is not suitable for very young children. Trips include at least two beach stops (water frolics are encouraged!). 6 person minimum; 14 person maximum (larger groups can be accommodated if you supply your own camping equipment). Special pricing for Scout Troops who provide camping equipment and cook their own meals. Most trips occur on weekends but midweek trips can be arranged. and yet are a world apart from the frenetic pace of urban living!